Yield: Serves four to six as a side dish. With a mortar and pestle, pound the garlic and a pinch of salt to a paste, or mince the garlic, sprinkle with salt, and mash into a paste with the side of a chef’s knife. Combine the garlic paste and 1 Tbs. of the lemon juice in a small bowl and let sit for 10 minutes. Combine the shallot with the remaining 1/2 Tbs. lemon juice and a pinch of salt in another small bowl and let sit for 10 minutes. Whisk the olive oil, cumin, and cayenne into the garlic mixture. Season to taste with salt or cayenne, if necessary. Prepare a medium-high charcoal or gas grill fire. Brush both sides of the eggplant slices with olive oil and season with salt. Grill (covered on a gas grill; uncovered on a charcoal grill) until golden-brown grill marks form, 3 to 4 minutes. Turn the eggplant and grill until tender and well marked on the second sides, 3 to 4 minutes more. The interior should be grayish and soft rather than white and hard. 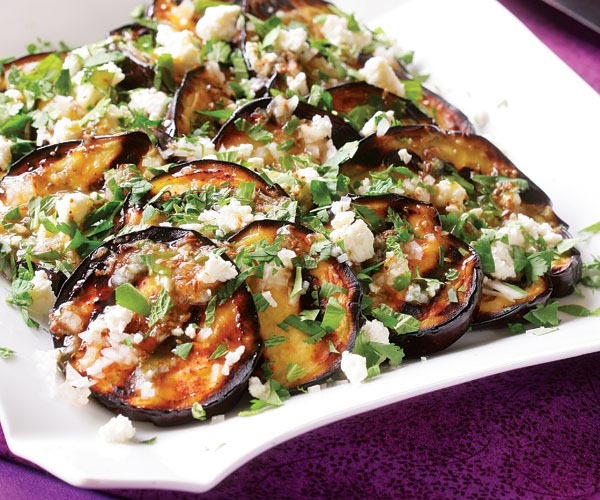 Top grilled eggplant slices with the shallots, feta, and herbs. Whisk the vinaigrette and drizzle it on top. Serve immediately. 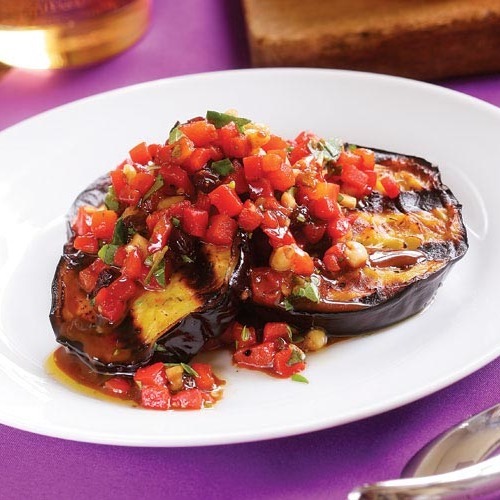 This DELICIOUS dish has become our go-to for garden eggplant season. The detailed steps are absolutely worth it as the result is a magical combination. Do it, you won't be sorry! This dish was absolutely perfect and delicious. I doubled the recipe and followed it exactly as it was written. Do not change a thing. There's a video included in the link which I watched and really helped. We accompanied the dish with BBQ burgers, baked beans and potato salad. It added freshness and tang to the menu. This will definitely be a staple. Easy and fast. I served it over a bed of kale.